It's 365 days, 12 paychecks and one birthday. 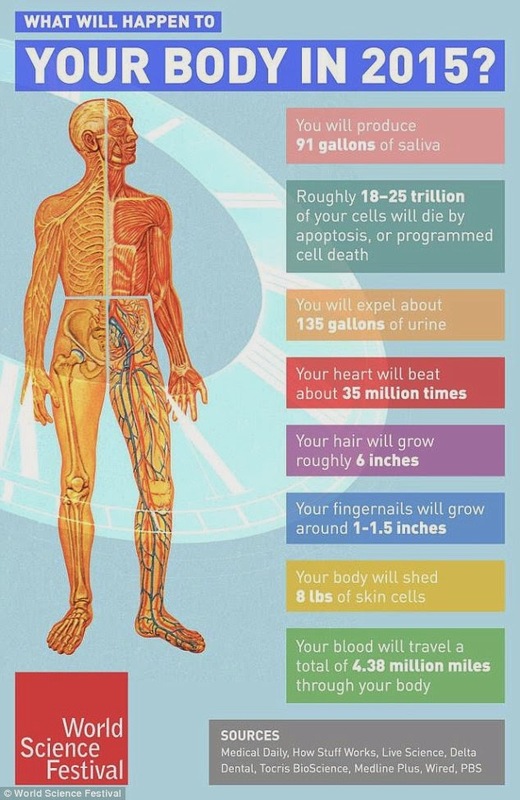 But did you know in this time your body will produce enough urine to fill two bathtubs? The average person will excrete 135 U.S. gallons of urine in one year. And that's not all the fluid they'll expel; they will also produce 91 U.S. gallons of saliva, enough to fill 230 magnums of champagne. Their heart will beat about 25 million times, and they will blink 5, 606,400 times in 365 days, according to a graphic created by the World Science Festival. Roughly 18 -25 trillion of their cells will die by apopotosis - programmed cell death. Some of these cells will be skin cells, and so they will shed eight pounds worth of skin, the equivalent of eight bags of sugar. Their hair will grow roughly six inches, and their fingernails will grow up to one and a half inches. While luscious hair and long nails might be welcome, the 5,475 times they break wind might not be so popular. Whether they are bored, tired - or both - most people will yawn 1,825 times a year, and should sleep for an average of 2,920 hours. Their blood will travel a total of 4.38 million miles through the body, the same distance as travelling around the world's equator 176 times, or from Australia to the South Pole 50 times.